I hadn’t been to downtown Phoenixville in eons, and I knew it was all souped up these days, but I had no idea how cute it would be! It’s seriously cute. And there’s tons of shops and restaurants, including Majolica, a BYOB. This place is adorable. It’s warm and inviting, except for their metal table tops which are disturbingly frigid! 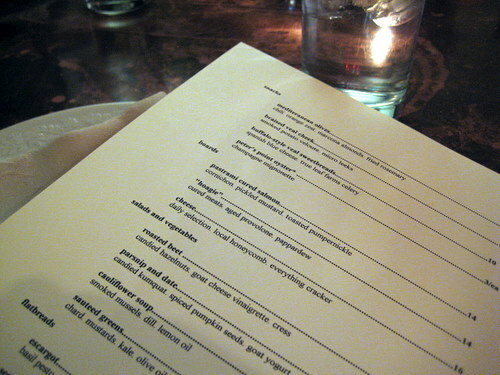 It’s considered New American cuisine and it even made the Philadelphia magazine’s 50 Best Places to Eat Right Now list. 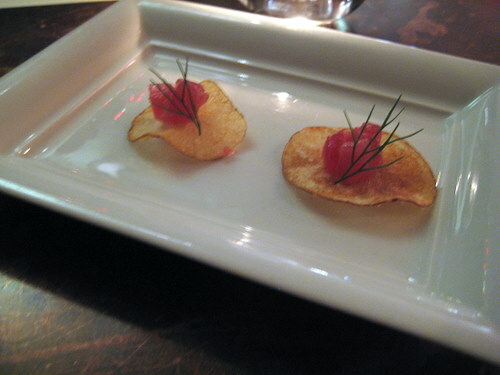 The meal started off with a complimentary amuse bouche of homemade potato chip with tuna ceviche and fennel. Delicious! This was definitely not a greasy chip from a bag! The salty and crispity chip went nicely with the soft tuna. The menu is not large. As far as starters go, there are a few snacks, boards, salads, and flatbreads to choose from. 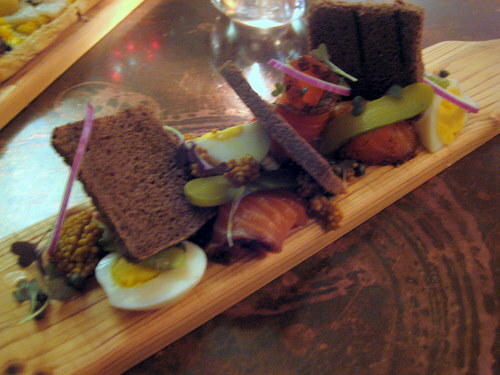 We got one of the boards – pastrami cured salmon with cornichon, pickled mustard seeds, red onions, capers, and hard-boiled egg, with toasted pumpernickle slices. This dish was super cute and came out on this long wooden board. It’s definitely a DIY dish as you have to assemble your own little open faced sandwich. The salmon was quite good but we didn’t taste much pastrami in it. I really liked that instead of boring mustard there were whole pickled mustard seeds which popped in your mouth. This was a cute and tasty dish. 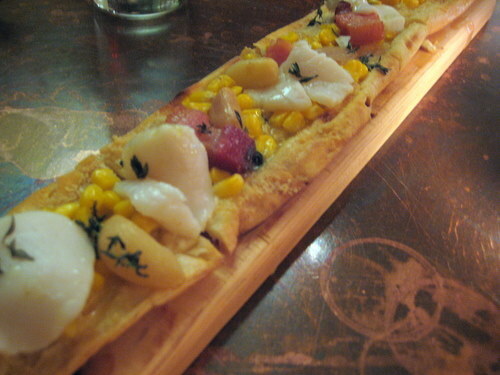 We also tried one of the flatbreads – scallop, sweet corn, smoked bacon, parmesan, and thyme. These are like long skinny pizzas. This also had lovely soft pieces of roasted garlic that just melted in your mouth. This was definitely good, but it wasn’t particularly exciting. None of the flavors were really wow, they were all just sort of good. Perhaps I just expected something a bit more interesting. 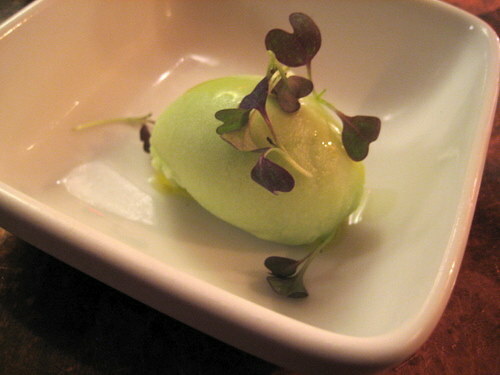 While we waited for our pasta entrees, they brought us a palate cleanser of cucumber sorbet. Mmm, this straight up just tasted like cucumbers. And I love cucumbers, so I thought this was totally awesome. 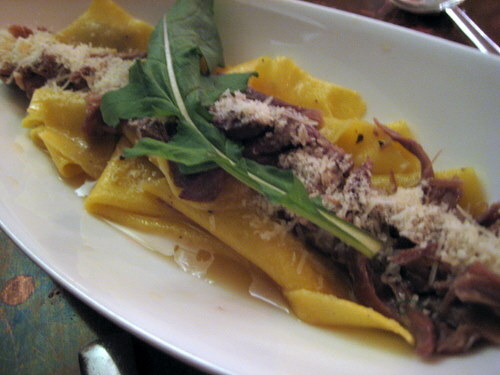 One of our pasta dishes was the fazzoletti pasta with duck confit ragout, parmesan, arugula . I don’t know what fazzoletti means, but from the looks of it, it’s just big wide sheets of pasta. This was super good and you could totally taste the duck fat, lots and lots of duck fat! It wasn’t gamey at all and the flavor worked well with the plainness of the pasta. 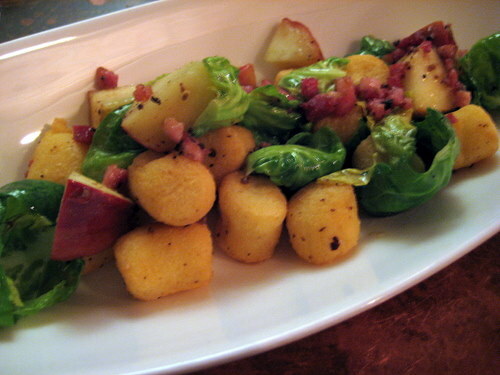 The winner of the night was the parisian style gnocchi with brussel sprout leaves, pancetta, apples, and truffle butter. This was unlike any gnocchi we’ve ever had. It’s not thick or chewy or doughy. It was crunchy-ish on the outside and the inside was just melt in your mouth. Turns out that these aren’t the potato based gnocchi that you might be thinking of. Parisian gnocchi is made with flour and specifically uses cream puff dough. Yes, while this is the same dough used to make eclairs and profiteroles, it can also be used to make a delicious pasta. This was so different and delicious! Service was good and everyone was friendly and accommodating. One odd thing was when we tried to get a reservation, they wouldn’t give us the time we wanted. Then when we got there, there were plenty of empty tables available. So what was that about? Do you not give reservations on the half hour? Other than that and the icy tables, it was a lovely dinner. This was really helpful, I’m glad by performing a little google searching We can find such a invaluable post, thanks, I’ll be checking to return tomorrow as it’s highly late here lol: –).